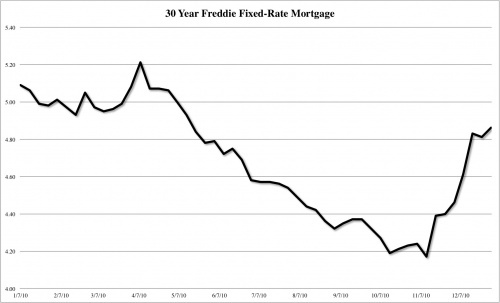 The following chart shows the recent rise in mortgage rates. This spells disaster for housing which was recently described by Robert Shiller as a market "where optimism is fading fast." The time to purchase a home is when interest rates are high. (If you are interested in making money on your home.) The reason is because as interest rates fall it lowers monthly payments and allows new buyers into the market or current buyers to purchase at higher prices with their current income level. Higher demand (more buyers) = higher prices if supply stayes equal. Lower demand (less buyers) = lower prices if supply stayes equal. The most recent rise in mortgage rates that can be viewed in the chart above pushed the monthly cost of a $300,000 mortgage from $1,462 to $1,585 per month. I only wanted to review this discussion because a realtor mentioned to my parents over Christmas break that they had buyers rushing into the market because interest rates were rising and they wanted to lock in at low rates. This is the exact opposite way potential home buyers should be making a buying decision. "There's one good financial idea every decade or so, and 5 to 10 marketing ideas a week." "It is not the man who has too little, but the man who craves more, that is poor." "When buying a used car, punch the buttons on the radio. If all the stations are rock and roll, there's a good chance the transmission is shot." "A bank is a place where they lend you an umbrella in fair weather and ask for it back when it begins to rain." "There are decades where nothing happens; and there are weeks where decades happen." "It isn't bold to print money. It will be bold to withdraw it later." "Bull markets bail you out of your mistakes. Bear markets make you pay for them." "Government bonds once offered risk-free return. They now offer return-free risk." "We should be careful to get out of an experience only the wisdom that is in it and stop there lest we be like the cat that sits down on a hot stove lid. She will never sit down on a hot stove lid again and but she will never sit down on a cold one either." "It's waiting that helps you as an investor, and a lot of people just can't stand to wait." "One of the best rules anybody can learn about investing is to do nothing, absolutely nothing, unless there is something to do. I just wait until there is money lying in the corner, and all I have to do is go over there and pick it up. I wait for a situation that is like the proverbial shooting fish in a barrel." "Capitalism without financial failure is not capitalism at all, but a kind of socialism for the rich." "At this juncture, the impact on the broader economy and financial markets of the problems in the subprime market seems likely to be contained." "Everything that needs to be said has already been said. But since no one was listening, everything must be said again." "When people are getting richer and richer but they're not actually producing anything, it can't end well." "In economics things take longer to happen than you think they will, and then they happen faster than you thought they could." "I don't write about what I know. I write to find out what I know." "Chains of habit are too light to be felt until they are too heavy to be broken." "Everyone has a plan until they get punched in the mouth." "Interest on the debt grows without rain." "You can have comfort, or you can have value. You cannot have both." "Investors should remember that excitement and expenses are their enemies. And if they insist on trying to time their participation in equities, they should try to be fearful when others are greedy and greedy only when others are fearful." "No very deep knowledge of economics is usually needed for grasping the immediate effects of a measure; but the task of economics is to foretell the remoter effects, and so to allow us to avoid such acts as attempt to remedy a present ill by sowing the seeds of a much greater ill for the future." "Men who can both be right and sit tight are uncommon." There is no means of avoiding the final collapse of a boom brought about by credit expansion. The alternative is only whether the crisis should come sooner as the result of voluntary abandonment of further credit expansion, or later as a final and total catastrophe of the currency system involved. "Most investors think quality, as opposed to price, is the determinant of whether something's risky. But high quality assets can be risky, and low quality assets can be safe. It's just a matter of the price paid for them." "Whenever you find yourself on the side of the majority, it is time to pause and reflect." "None are more hopelessly enslaved than those that falsely believe they are free." "The longer the markets disobey basic rules of valuation, the bigger the opportunity for good investors to reap the benefits. Value investing works precisely because markets become dysfunctional at times." Bull markets are born on pessimism, grow on skepticism, mature on optimism, and die on euphoria. The time of maximum pessimism is the best time to buy, and the time of maximum optimism is the best time to sell. "People only accept change in necessity and see necessity only in crisis." Requiring a central bank to print money to increase government's purchasing power invariably ignites a hyperinflationary firestorm. The result through history has been toppled governments and severe threats to societal stability. "It is well enough that people of the nation do not understand our banking and monetary system, for if they did, I believe there would be a revolution before tomorrow morning." "Do you want to sell sugared water for the rest of your life? Or do you want to come with me and change the world?" "I'd be a bum on the street with a tin cup if the markets were always efficient." "The market can stay irrational longer than the investor can stay solvent." "While the government struggles to save one crumbling enterprise at the expense of the crumbling of another, it accelerates the process of juggling debts, switching losses, piling loans on loans, mortgaging the future and the future's future. As things grow worse, the government protects itself not by contracting this process, but by expanding it." "The test of a first-rate intelligence is the ability to hold two opposing ideas in mind at the same time and still retain the ability to function." "All our life, so far as it has definite form, is but a mass of habits - practical, emotional, and intellectual - systemically organized for our weal or woe, and bearing us irresistibly toward our destiny, whatever the latter may be." "Men it has been well said, think in herds; it will be seen that they go mad in herds, while they only recover their senses slowly, and one by one." The greatest enemy of knowledge is not ignorance, it is the illusion of knowledge. "Give me control of a nations money supply, and I care not who makes it's laws." Illusions commend themselves to us because they save us pain and allow us to enjoy pleasure instead. We must therefore accept it without complaint when they sometimes collide with a bit of reality against which they are dashed to pieces. Many of life's failures are people who did not realize how close they were to success when they gave up. If you think you can or think you cannot, you are correct. If something cannot go on forever, it will stop. These are personal observations on the market and the economy. I am not a financial advisor. Please consult with one before making any financial decisions.